Another year has come and gone, the fifth year of this blog in fact, and it’s been without a doubt the best year yet. Here are the most popular articles on the site from the last 12 months plus other model railway highlights of 2018. Aside from the articles and posts below, 2018 was a huge year for Model Railway Engineer. Among the highlights for me were seeing the site surpass 30,000 followers on social media, becoming recognised as an ‘Elite’ blog by Ace Media and the blog’s companion community group smashed through 3,000 members! 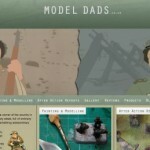 There have been some wonderful new developments for model railways over the last twelve months. More and more DCC locomotives came out and small businesses like DCC Concepts and Train-Tech released ever more innovative and interesting products. Train Tech’s Smart Screen was undoubtedly the development of the year for me although DCC Concepts working point rodding was a close second. Watch the videos below for a demo. I’ll be reviewing the Smart Screen as soon as I can stop myself spending money 009 locomotives and buy a unit. I’m looking forward to seeing what comes out in 2019. Show visits this year were topped out by a visit to Warley National Model Railway Exhibition. It’s the biggest event in the model railway calendar and although a long way for me (Guildford to Birmingham by train is a long, expensive, trip) it’s definitely worth doing and I felt this year was one of the better ones. It was certainly great to catch up with old acquaintances and meet a few of Model Railway Engineer readers and community members there. Another highlight of 2018 was the Great Model Railway Challenge with James Richardson, Steve Flint, Kathy Millat, Tim Shaw on Channel 5. The show saw teams of railway modellers competing in a series of knockout heats to create amazing miniature masterpieces on specific themes. While it apparently did well in the rating, railway builders in the MRE community were divided over the show. Some found it simplistic and the hosts irritating while others— myself included — seeing it for what it was: a bit of model railway fun for the masses much in the same was the Great British Bake Off was a cookery show for mass consumption (excuse the pun). Whatever your view, it was good for the hobby, opening model railways up to a wider audience than would normally consider it and it saw many more people introduced to the hobby in 2018. Aside from model train innovations, 2018 also saw a significant anniversary of railway history. In August, railway enthusiasts marked the 50th anniversary of the end of regular mainline steam services in the UK. Events were held at heritage railways across the country, including Grand Central Railway, Leicestershire; Severn Valley Railway, Worcestershire and Ribble Steam Railway, Preston. The year also saw the passing of Sir William McAlpine. A keen rail enthusiast, McAlpine had built a full-sized railway at his estate Cambridgeshire but was most well known in heritage railway circles as the saviour of the Flying Scotsman. The locomotive had been due to spend the rest of its days in an American museum when he purchased it in 1973, brought it back to England and pressed it back into service for day trips. Sir William McAlpine died Sunday, March 4. In terms of my own modelling activities in 2018, I started my first narrow gauge layout, spent way too long faffing around with point motors and failed to make much progress on my shed layout but that was due to the wonderfully long hot summer we experienced in the UK. The narrow gauge project was for me one of the most interesting and exciting. 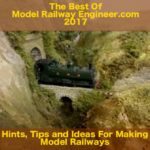 As long-term readers know, I build and test a LOT of model railways and layouts for the guides and tips on this blog. Historically, these have been in UK standard OO gauge and N gauge but I’ve also ‘play-tested’ over scales including HO and Z gauge. Exploring narrow gauge – 009 and HOe – has been the eye-opener of 2018. These allow construction of track to 9mm scale track (N gauge) while employing rolling stock bodies and models in OO or HO scale. Like everyone, my eyesight is very gradually degrading and I have to admit I don’t enjoy working in N gauge as much as I once did because I can’t see all the glorious detail I once did. To find scales that allow me to build elaborate track arrangements without acres of space yet still enjoy the modelling aspect is wonderful! 009 and HOe scale are likely to play an increasingly large part in my modelling future. That’s it for this brief review of the year, in terms of tips and guides 2018 was another record year for the blog with more published than ever before. Here’s a snapshot of the most popular. 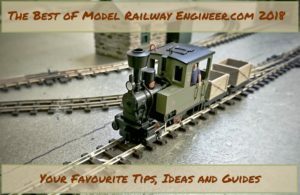 What I wish I’d known before starting a model railway – 2,200 shares. I love Instagram and upload pics and videos of my model train activities regularly, of the hundreds of posts these two got the most attention. Of all those I’ve tried and tested for model railways here on the blog, these are the ones I recommend and get asked about the most. Of the hundreds of tips here, these 5 are perennial favourites, even more so in 2018. With 2018 over with, what would you like to see covered on the blog in 2019? Are there any tools you’d like me to review, modelling techniques you want explaining or problems with your layout construction you need answers with? 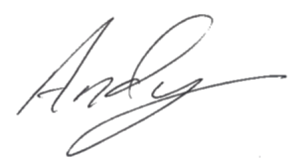 As always, it takes a lot of time, effort and energy maintaining this blog so if you have any suggestions for posts or subjects you’d like covered, dropping a quick comment, even just saying Hi and what you’re working on, gives me encouragement to continue. Thanks and have a fantastic 2019!